Yet another vegetarian dish – Haryali Kofte by Shabana Akbany. 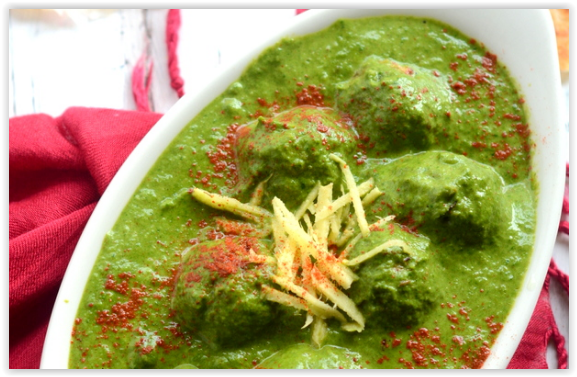 Hariyali kofte are basically paneer kofte cooked in thick and creamy spinach gravy. It’s easy to make, and sometimes provides a welcome change from the traditional Malai Kofta. Food historians trace the word KOFTA, used in variations throughout the Middle East, India and Central Asia to the Persian KOOFTEH, which means pounded meat. Grate paneer. Mix paneer, corn flour, jeera powder, red chilly powder and salt. Mix all ingredients of the filling together. Make 8 small balls, stuff a bit of nuts in each ball, roll in dry Maida and deep fry one at a time to a light golden color. Keep aside. Discard stems of the paalak leaves. Wash leaves in lots of water to clean it well. Pressure cook with 1/4 cup of water and give one whistle. Keep on low flame for 6 – 8 minutes. Remove from fire. Cool it. Grind along with green chilies in a mixer. Heat ghee or oil and fry the onions to a light golden color. Add tomato puree and cook for 2 – 3 minutes. Add ginger and garlic paste, and cook for 1 minute. Add salt, halide and garam masala, stir for minute. Add paalak and cook for another minute. Add 2 cups of water to get thin green gravy. Boil and keep on low flame for about 10 – 15 minutes. At serving time, add the Paneer Balls, keep on low flame for about 1 minute. Tip: Serve this dish hot with paranthas or hot jeera rice.